$5.95 Shipping on all orders ~ Any size ~ Every day! For a vintage prairie inspired look, this feed sack advertising inspired pillow is sure to give your home a cozy rustic feel. 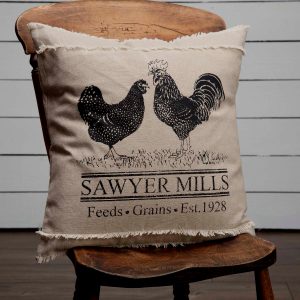 This large pillow measures 18x18" and is made of a cotton khaki chambray is a rooster-themed black stencil in the center with 2 rows of fringed seems on the top and bottom... Reverses to solid khaki chambray and 2 tie closures. Don't miss out on news and specials! Subscribe to our Newsletter to stay informed!